Predicting how a mild blast concussion might affect a military service member six to 12 months after the injury might hinge on clinical factors that can be assessed in the combat theater. Older age, more severe post traumatic-stress symptoms and a diagnosis of traumatic brain injury appear to increase the risk of later adverse outcomes. These findings are reported this week in the journal Brain. The results add to growing evidence that psychological health impairments, combined with a traumatic brain injury during combat deployment, greatly raise the likelihood of disability. “Injuries like this are perceived by many as trivial but appear to result in significantly worse outcomes overall and worse psychological health, in particular,” noted Christine Mac Donald, UW assistant professor of neurological surgery. In this prospective, observational study, none of the injured military personnel were medically evacuated. All returned to duty, reported the lead author of the study, Christine Mac Donald, formerly of Washington University in St. Louis and now an assistant professor of neurological surgery at the University of Washington in Seattle. David Brody of Washington University in St. Louis is the study’s senior author. The research team worked with Lt. Cmdr. 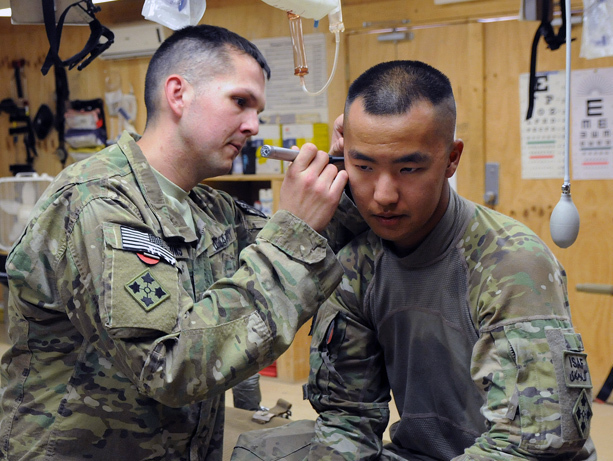 Octavian Adam, a neurologist deployed to care for U.S. troops in Afghanistan. The study took place between March and September, 2012. Participants were evaluated within a week of injury at two sites in Afghanistan and again six to 12 months later in the United States. During the acute phase of brain injury, assessments of the study participants revealed heightened post-concussive, post-traumatic stress and depressive symptoms, and worse performance in cognitive skills tests. The evaluation and treatment of these service members in the combat theater followed standardized Department of Defense protocols, which focused primarily on cognitive function and not mental health. At six- and 12-month follow-up, 63 percent of subjects with traumatic brain injury had moderate overall disability, compared with 20 percent of a control group, Mac Donald said. Those in the brain-injury group were more likely to have post-traumatic stress and depressive symptoms, neurobehavioral difficulties and impairment from headaches, while cognitive performance was largely normal. U.S. soldiers with Alpha Battery, 2nd Battalion, fire an artillery round from a Howitzer Aug. 22, 2014, at Kandahar, Afghanistan. U.S. soldiers fire a Howitzer in Khandahar, Afghanistan, in August 2014. None of the participants had a recorded history of post-traumatic stress disorder, depression or other mental-health disorder that would have prevented them from being deployed in a war zone. The findings were surprising, Mac Donald said, given the relatively mild traumatic brain injury sustained by these participants and their ability to return to active duty. “Injuries like this are perceived by many as trivial but appear to result in significantly worse outcomes overall and worse psychological health, in particular,” she noted. She added that this study was not designed to check the effectiveness of early interventions on servicemen’s longer-term outcomes, nor address the implications of these findings with patients who have experienced such an injury more than a year ago. Explosive mechanisms and blast exposures have been a major cause of combat casualties in the past decade. Previous studies have suggested that roughly one-fifth of the U.S. force deployed in wars in Iraq and Afghanistan suffered a head injury, and of these, 83 percent were characterized as mild, uncomplicated concussions. "The long-term impact of these injuries is just beginning to be appreciated,” Mac Donald said. U.S. Navy corpsmen waiting on the flight line for incoming battlefield casualties at Kandahar Air Field in Afghanistan. US Navy corpsmen waiting on the flight line for incoming battlefield casualties at Kandahar Air Field in Afghanistan. Study participants were enrolled at Kandahar Air Field and Camp Leatherneck in Afghanistan. A subset of the initial group went to Washington University for follow-up evaluations. The study was conducted under a protocol reviewed and approved by the U.S. Army Medical Research and Material Command Intuitional Review Board and approved by the Human Research Protection Office at Washington University. It is not yet known whether early efforts to mitigate psychological health right after a military blast concussion would improve outcomes among those at high risk. The study was funded by the Congressionally Directed Medical Research Program (PT090444). Editors: Contact Brian Donohue, 206.543.7856, to speak with Dr. Christine Mac Donald.